The Soyuz TMA-04M spacecraft is raised into position at launch pad ne, Sunday, May 13, 2012. at the Baikonur Cosmodrome in Kazakhstan. 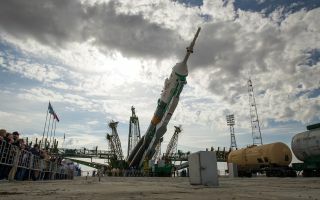 In this cool space wallpaper, the Soyuz TMA-04M spacecraft is raised into position at launch pad on Sunday, May 13, 2012 at the Baikonur Cosmodrome in Kazakhstan. The launch of the Soyuz spacecraft with Expedition 31 Soyuz Commander Gennady Padalka and Flight Engineer Sergei Revin of Russia, and prime NASA Flight Engineer Joe Acaba is scheduled for 9:01 a.m. local time on Tuesday, May 15.